From Poison’s Every Rose Has A Thorn to Cadbury’s Roses, these beautiful flowers enjoy a strong link with love and romance. Well, they do now. It hasn’t always been like that. 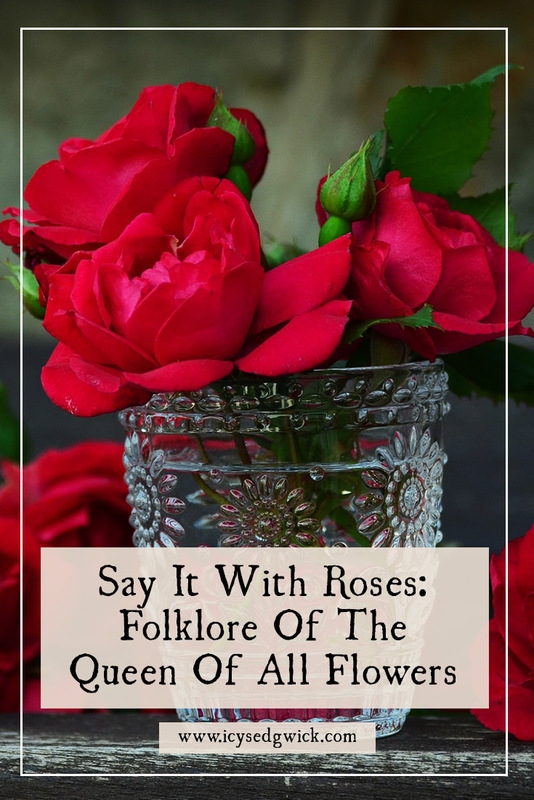 As it’s Valentine’s Day, I figured now was as good a time as any to explore the folklore and legends of roses! You can read my other flower folklore posts here. First cultivated in Persia, roses also appear on wall paintings and personal items in Egyptian tombs dating to the 5th century BC. In the same century, the Chinese extracted oil from the roses in the Emperor’s garden. This oil was so valuable that only nobles could use it. The Sumerian seal, dating to c. 3300 BC, bears a stylised rose design as a symbol of the goddess Inanna. 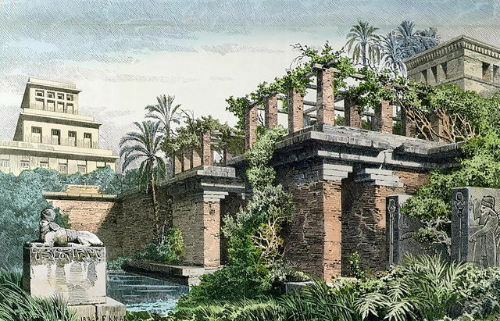 Roses also grew in the Hanging Gardens of Babylon. 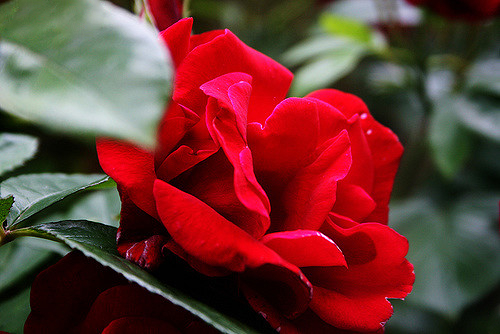 Ancient Egyptians believed the rose held magical properties. Embalmers used attar of roses oil during the embalming process of mummies. It’s unsurprising given the rose represented the goddess, Isis. Her followers added roses to funeral wreaths to indicate the successful passage of the dead through the Hall of Judgment. Cleopatra apparently covered the palace floors in rose petals when she made her play for Mark Antony. Roses appear throughout Greek myths, including origins for the flowers themselves. According to the poet Anacreon, white roses appeared from the sea foam that dripped off Aphrodite when she was born. The white colour represented her innocence and purity. Later in her life, she bled on a white rose while trying to heal the wounded Adonis. This created red roses, representing passion and desire. At the wedding of Eros and Psyche, the seasons and charities scattered rose petals across the land to celebrate. Flora, Goddess of Spring, found her dearest nymph dead. She asked the other gods to turn her loved one into a beautiful flower. Apollo, Bacchus, Vertumnus, Pomona and Flora all contributed gifts and the nymph became the rose, seen as Queen of all the Flowers. Apparently, Flora ended up being struck by Cupid’s arrow. The pain caused her to mispronounce Eros as ‘ros’, and so the flower got its name. Note: Cupid is the Roman equivalent of Eros, which demonstrates the slippage between Greek and Roman myths. Another origin story concerns Cupid. In one variety, he knocked over a bowl of wine. A rose bush grew out of it, and it was dedicated to his mother, Venus. In another version, he knocked red wine over white roses and stained the flowers. A third origin story involves Flora. Zephyrus, god of the west wind, fell in love with Flora. Problem was, she only cared about flowers. He turned himself into a rose to catch her eye. When she spotted the rose, she gave it a kiss. This no doubt made the god’s day but demonstrates the Roman gods’ inability to observe boundaries. The Romans loved roses so much that emperors scattered rose petals across their floors. Guests crowned grooms and brides with crowns of roses. The Roman love of these flowers is reflected through the creation of public rose gardens by the nobility. But it wasn’t all sweetness and light. According to Rose magazine, roses also represented suffering. Rhodanthe tried to oust Diana as the goddess of the hunt, so Apollo turned her into a rose as punishment. But elsewhere, the legend tells that the beautiful maiden Rhodanthe sought refuge from her army of suitors in Diana’s temple. Being the jealous sort, Diana turned her into a rose and her suitors into thorns. Katknit at You’re History notices the early links between roses and the Islamic world. Here, Mohammed suspected his wife of adultery. He tossed a bouquet of red roses into a pool and they turned yellow, confirming her guilt. The early Christian church rejected the rose after connecting it with trickery. Apparently, roses were also originally thornless. They only developed thorns after the Fall of Man. 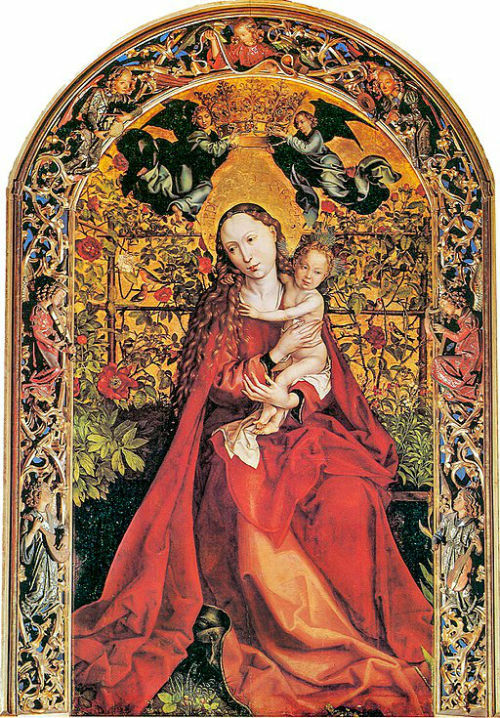 But by the medieval period, roses became part of accepted Christian iconography. 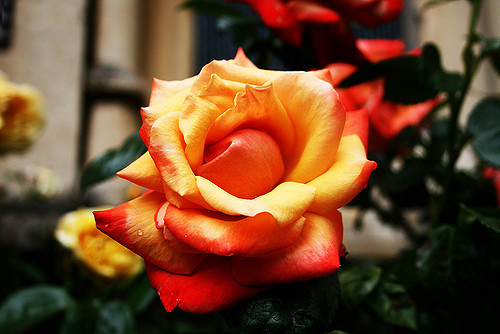 Christians adopted the rose to represent the Virgin Mary in particular. In their theology, a drop of Christ’s blood fell on a bush during the crucifixion. The bush became a rose bush. Some think the white rose appeared when the Virgin Mary hung her coat over a red rose bush. Others think the red rose turned white after Mary Magdalene’s tears fell on the petals. Either way, the passion of the red rose is purified by this holy women to create a white rose. These Christian links may explain why knights wore roses during tournaments to demonstrate their gentleness (Binney 2018: 21). According to Claire Nahmad, the Christian martyr St Dorothea was also linked with roses. A judge sentenced her to death, and his secretary, Theophilus, said, “Send me some fruit and roses, Dorothea, when you get to paradise”. After her death, an angel appeared to Theophilus to pass on a gift basket. He vanished after he’d handed over the roses and Theophilus converted to Christianity (1994: 84). 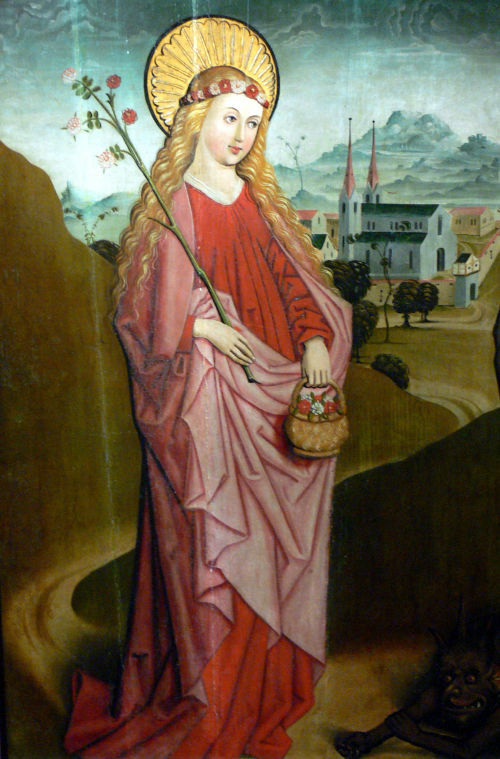 Now the patron saint of gardening, St Dorothea carries a rose branch and wears a wreath of roses as a crown. I didn’t necessarily want to talk about the Tudor Rose since it’s not directly about folklore. In short, the House of Lancaster used the red rose as their symbol. Their rivals, the House of York, used the white rose. When Henry VII (Lancaster) married Elizabeth of York, he combined the two colours into the Tudor Rose. It was basically an early form of branding. It showed people his rule was legitimate since he’d married Edward IV’s daughter, uniting the warring houses. And all done with flowers. The giving of roses is a time honoured tradition in the western world. Particularly on Valentine’s Day! But some superstitions accompany the practice. If you’re cutting a rose, be careful no petals fall from the flower, otherwise, you’ll have bad luck. And in Italy, there’s a belief that giving a rose in full bloom brings death to the recipient. So only give rosebuds as gifts. 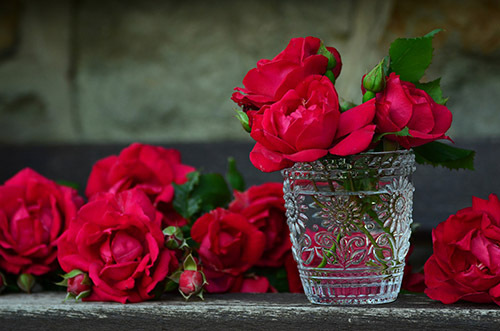 Margaret Baker claims dreaming of red roses is a sign of success in love and good luck. She also says that in Scotland, if a red rose blooms in autumn it means a wedding is on the way. It marks a bad omen for white roses bloom to a second time in late summer (2011: 130). She also notes the practice of planting rose bushes on graves. A red rose spoke of the goodness of the deceased. A white rose marked a virgin. On a slightly weird note, in the Tyrol, an alpine rose growing on the roof could protect the house against lightning strikes (2011: 131). You may have encountered the term Sub rosa. The Latin phrase means “beneath the rose”. In ancient societies (particularly Rome and Greece), if a rose hung from the ceiling then conversations below should be kept confidential. So where does the practice come from? For the Greeks, it refers to their gods. Aphrodite gifted Eros with a rose. He in turn gave it to Harpocrates, who was the god of silence. Here, it meant “don’t kiss and tell” but it helped start the notion of roses and secrecy. The Romans continued the practice in their dining rooms. The Catholic tradition also took it on, sometimes marking confessional boxes with roses. The Jacobites adopted a white rose as a symbol in Scotland due to their need for secrecy. Plaster ceiling roses took over the same function and can still be seen today. 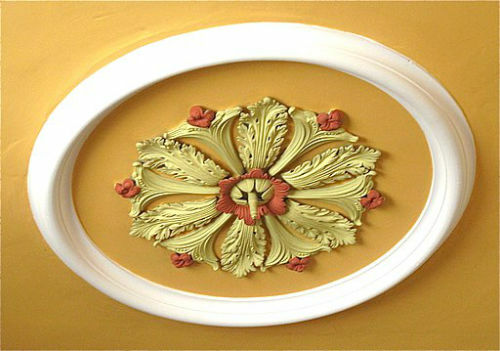 The image below shows a plaster ceiling rose from Plough Lane Chapel in Brecon. It dates to around 1880, and a gas pipe shows its intended use as a light fitting. 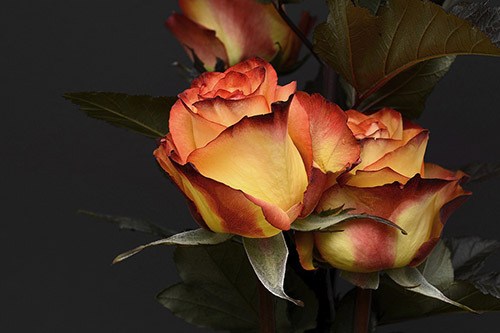 Where roses now traditionally mean ‘romance’, their meaning differed in the Victorian language of flowers, based on their colour. Note: Sources disagree on the meanings so the list below is an aggregate of variations I’ve seen. But you may know others! So feel free to comment and let me know which colour meanings you know. White represented innocence and chastity. Red meant ‘I love you’, and stood for unconditional love (so not a great choice for first dates). White roses with red-edged petals meant unity. Pink meant elegance and platonic love. Yellow meant infidelity and jealousy. Some sources say yellow roses represent friendship or joy. No legends or stories back this up, unlike their meaning related to infidelity. So the theory is florists changed the meaning to help sell yellow roses. As you can see, there’s a lot more to roses than meets the eye. And if you’re interested in their medical uses, head over to Witchipedia. 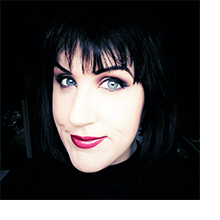 Why not drop me a comment and let me know your favourite rose-related story? Binney, Ruth (2018), Plant Lore and Legend, Hassocks, Rydon (aff link). Nahmad, Claire (1994), Garden Spells: The Magic of Herbs, Trees and Flowers, London: Pavilion Books (aff link). What a fun and informative post. Thanks for the ping-back!